Desinged for athletes & outdoor lovers, it keeps your AirPods together for listening and securing! The ClipBack is great for the active lifestyle and outdoor leisure. Designed specifically for athletes, this lightweight and compact strap provides a comfortable and secure fit. With UV resistance you can enjoy the freedom to take your AirPods with you when you workout in the hot sun. It retains a fully sweat-proof modeling so you can work out to the max both indoors and outdoors. Keeps your AirPods together so you do not have to worry about misplacing them. With the option for a joint headphone design you can keep your AirPods bound together and work out hard. Built-in strong magnets make it easy to securely wrap around your neck and carry while not in use. 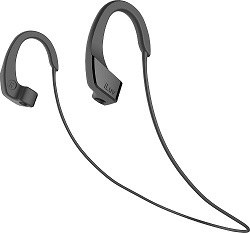 Now you can walk around the gym comfortably without worrying about losing your AirPods. There's no need to worry, iLuv's ClipBack is easy to install. Simply snap your AirPods in, and wrap the brackets around your ears to use. ClipBack features a special security hole specially designed to hold Apple's Airpods very tightly. Additionally, with a sleek and sturdy strap, you can easily keep you Airpods placed around your neck, or anywhere else that you can secure the strap. That's right! iLuv's ClipBack features a one-size fits all design that can be used by anyone and everyone. No matter how big or small your body type is, this AirPods security strap will always remain comfortable. Simply adjust your AirPods up/down to fit your ears' size, and enjoy your music wirelessly. No matter what size - little children, teens and even fully grown adults - ClipBack is great for everyone. Extreme durability separates ClipBack from other AirPods security straps. Composed of unique and high quality material, the ClipBack ear hooks contain durable outer surface with glossy finish that prevents them from breaking and a special smooth interior that provides flexibility for the comfortable fit. Metal wires built in 23 inch fashionable strap upgrade ClipBack to the next level of durability. It will secure your AirPods even during intense activity. Easy installation design so you can simply snap your AirPods in and wrap the brackets around your ears to use. Experience a world beyond your imagination.